New councilwoman had a busy first two months in office but tells Tribune she is just getting warmed up. Jo Ann Hardesty has had a very eventful and — she believes — successful first two months as the first African-American woman on the City Council. 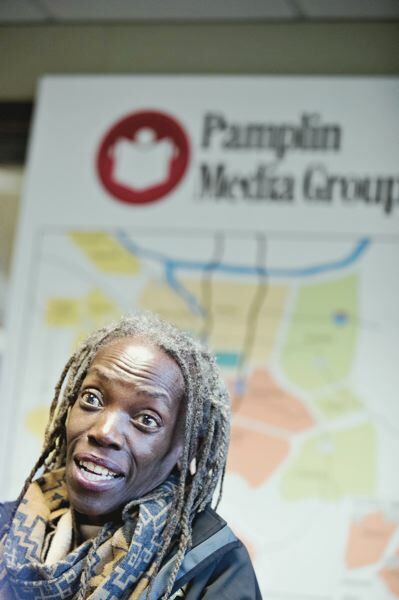 Interviewed Friday, March 1, by the Portland Tribune editorial board on her 60th day in office, Hardesty energetically ticked off her major accomplishments. They include keeping a campaign promise by pulling the city out of the Portland FBI Joint Terrorism Task Force; delaying earthquake warning requirements for private owners of unreinforced masonry buildings; and sponsoring the ordinance implementing the Clean Energy Fund initiative she championed at the November 2018 general election. "I've been very busy," Hardesty said. But Hardesty said she's just getting warmed up. Plans call for being deeply involved in the upcoming sessions for next year's city budget; lobbying to convert a city-owned golf course into a mixed-income housing community; and working with the Charter Review Commission, which is scheduled to be appointed in 2021 to craft a ballot measure to change Portland's unique and unwieldy form of government. "It's going to get crazier before it settles down," Hardesty said. One thing not on her agenda is what some liberal activists are demanding — that Mayor Ted Wheeler give her the Portland Police Bureau. "No way," Hardesty laughed when asked if she wanted the bureau. "I'm not doing anything to encourage Wheeler to add it to my portfolio." Instead, after calling for an independent investigation into seemingly friendly texts between police Lt. Jeff Niiya and right-wing protester Joey Gibson, Hardesty said she wants to give Police Chief Danielle Outlaw the opportunity to own and resolve the issue. Hardesty said Outlaw, who is also an African-American woman, has been under attack from both the left and right since she took office in October 2017, and she worries that Wheeler and the mid-level managers in the bureau are not supporting her. "The Portland Police Bureau is in a state of flux. Outlaw could be a good chief, but hasn't had a chance to do what needs to be done yet," Hardesty said. The union representing Niiya has filed a formal complaint over comments made by Wheeler, Hardesty and Commissioner Chloe Eudaly about the texts after they were first reported by Willamette Week and the Portland Mercury. Given the opportunity to respond to the complaint, Hardesty said she stood by her previous statement. She declined to elaborate on what she called "Textgate," however, saying the complaint process should run its course. Hardesty's election to the City Council was a game-changer for several reasons, and not only because she is the first African-American woman. She defeated Commissioner Loretta Smith, who is also an African-American woman. 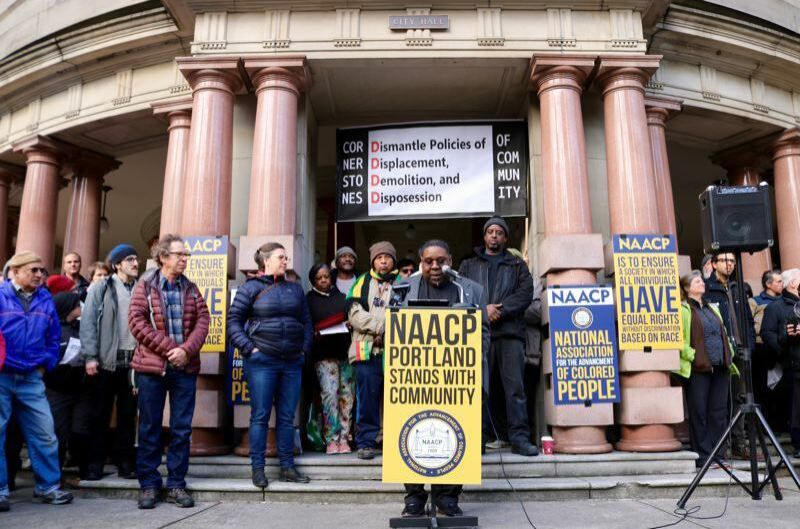 But Smith was perceived as a more establishment candidate than Hardesty, a former state legislator and longtime outspoken activist who was a previous president of the Portland chapter of the NAACP. Hardesty defeated Smith despite being outspent by her, demonstrating her grassroots support. Hardesty was the second grassroots candidate elected to the council in recent years, following the November 2016 general election victory of small business owner Chloe Eudaly over incumbent Steve Novick, despite his well-established progressive credentials. Their victories suggest the majority of Portland's historically liberal voters are moving farther left, putting even more strain on Portland's form of government, where every council member is elected citywide and oversees bureaus assigned to them by the mayor, which reduces the potential influence of lower-income parts of town. "It's the craziest thing I've ever heard of," said Hardesty, who nevertheless said she is doing everything she can to learn about her bureaus, which include Portland Fire & Rescue, the Portland Bureau of Emergency Management, and the Portland Bureau of Emergency Communications, which operates the 911 system. Although long identified as a police critic, Hardesty said she does not plan to fight its requested budget during the upcoming budget-writing sessions. Instead, she believes her public safety bureaus can be realigned to reduce the number of non-crime related 911 calls that go to the police, some of which result in what she thinks are avoidable tragedies. "If we can send a mental health worker out to a call of someone in crisis instead of a police officer, that would be better," Hardesty said. In response to questions, Hardesty said where she stands on several pressing issues. • Housing: Portland should convert one of its city-owned golf courses into a master-planned community with a mix of housing, including units affordable to low-income households. They include the Eastmoreland Golf Course in Southeast Portland, the Heron Lakes Golf Course in North Portland, the RedTail Golf Course in Southwest Portland, and the Colwood Golf Center and Rose City Golf Course in Northeast Portland. Only one — Eastmoreland — is along a MAX line. Hardesty did not name which golf course should be converted, saying, "People should fight over it." • Form of government: Portland's form of government should be changed only after a deliberative process involving the entire city. Although a City Club of Portland study committee recommended specific changes, Hardesty said they should not be determined by a single report. Instead, she said the city Charter Review Commission, which must be appointed in 2021, should undertake a citywide public involvement process to find consensus. • Unreinforced masonry buildings: Hardesty said the city should require the owners of such buildings to upgrade them against earthquakes. But she believes the city also should offer financial incentives to help offset the cost of such improvements. That is why she persuaded the council to delay earthquake warning requirements until Nov. 1, 2020. Hardesty believes a new task force and a new financial work group on the issue will present the council with minimum standards and financial options before then. Some buildings that were upgraded in the past could be grandfathered in, Hardesty said. • Residential Infill Project: Hardesty said she will support the current recommendation to increase residential density if she is convinced that will produce more lower-priced housing in every neighborhood. She will vote to rezone 93 percent of single-family neighborhoods to allow up to four units on every lot — as currently proposed — unless very little of the new housing is affordable to lower-income households. If not, she will push to rewrite the proposal when the City Council considers it this summer. • I-5 Rose Quarter Improvement Project: Hardesty said she opposes the plan to spend around $500 million improving the area where Interstate 5 and Interstate 84 merge in the Rose Quarter. She believes the money would be better spent on alternative transportation projects, including bike and pedestrian paths.